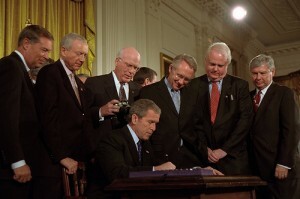 Ten years ago today, George W. Bush signed the Patriot Act into law in what many consider to be the single biggest blow to civil liberties our country has seen. I will leave it to others to detail the damage done to our rights, but a quick list of that damage can be seen here on the History Commons website. Instead, what I want to focus on is the prominent role played by the anthrax attacks in the passage of the Patriot Act. Although most would say that the Patriot Act was a direct result of the 9/11 attacks, timeline analysis shows that key events in the anthrax attacks took place during the critical days leading up to passage of the act. The timeline I have assembled here draws on data in timelines prepared by Marcy Wheeler, History Commons (anthrax), History Commons (Patriot Act) and Ed Lake, along with my own contributions. September 4, 2001 Exactly one week before the 9/11 attacks, Judy Miller disclosed Project Bacus, in which the Defense Threat Reduction Agency demonstrated that they could construct a functional small bioweapons facility at the Dugway Proving Grounds in Utah for under $1 million. The facility is capable of both growing and weaponizing biowarfare agents. September 18, 2001 Letters containing anthrax mailed to the New York Post and Tom Brokaw were postmarked one week after the 9/11 attacks. It is presumed that the letter that lead to the death of Robert Stevens of American Media in Boca Raton, Florida was also mailed around this time but the letter itself was never recovered. This Time article is designed to be a swan song to Robert Mueller’s career; it builds over almost 6,500 words to the conclusion that, “Most people inside the bureau believe that the blown opportunities to head off 9/11 would not recur today.” Mueller, the article suggests, has fixed the problems that led the FBI to miss 9/11. Of particular interest, though, is the article’s description of the FBI’s parallel tracking of two alleged WMD terrorists: the Saudi Khalid Ali-M Aldawsari and the white supremacist Kevin William Harpham. Two men, 1,300 miles apart, had Mueller’s attention when he convened his operations brief on Feb. 17. Khalid Ali-M Aldawsari, a 20-year-old Saudi national, studied chemical engineering at Texas Tech University. Kevin William Harpham, 36, an unemployed Army veteran and avowed white supremacist, lived in a small town near Spokane. On this day the FBI’s interest was a closely guarded secret, but indictments to come would allege that the two men were behind separate plots to set off powerful homemade bombs. Until recently, the FBI had not heard of either man. The Spokane attack struck without warning on Jan. 17. Shortly before the start of Spokane’s Martin Luther King Jr. Day parade, city workers found an abandoned backpack along the route. Inside was an explosive core laced with rat poison — an anticoagulant — and surrounded by lead fishing weights. A remote car starter and cell-phone parts were mated in a detonation circuit. The FBI lab in Quantico, Va., recovered DNA, but there was no suspect to test for a match. Good luck and shoe leather led the FBI to Aldawsari, the Saudi student. One of the trip-wire programs rolled out after 9/11 invited vendors of hazardous goods to report unusual purchases to the feds. Aldawsari went undetected at first as he acquired the ingredients of TNP, an explosive used in World War I artillery shells. Amazon.com filled an order for 3 gal. of concentrated sulfuric acid, and the Georgia-based QualiChem Technologies shipped 10 boxes of nitric acid to a FedEx mail drop. Neither reported the buys. Aldawsari also dodged a student-visa review after flunking out of Texas Tech. Only on Feb. 1, when he ordered phenol, his last ingredient, did Aldawsari trip an alarm. Carolina Biological Supply tipped the FBI’s Charlotte, N.C., field office, and Con-Way Freight, where Aldawsari planned to take delivery, sent word to the Dallas field office by way of the Lubbock police. By showing the parallel pursuit, Time reveals something disturbing about our country’s pursuit of terrorists. While the President gets briefed on suspected Islamic terrorists, he doesn’t get briefed on suspected right wing terrorists. Harpham’s plot, if the allegations prove true, turned out to be the more advanced. He had built a powerful bomb and placed it, for maximum carnage, atop a metal bench with a brick wall behind it to focus the blast. The half-complete work of Aldawsari, an Arab whose jihadi aims fit the popular image of a terrorist, received far more public attention. More than a year ago, Mueller raised some eyebrows when he testified that “homegrown and lone-wolf extremists pose an equally serious threat.” But that message did not take root in the body politic or even in the national-security establishment. As the FBI chased the twin terrorist plots all through February, President Obama’s team heard daily reports about Aldawsari’s case but not Harpham’s. Some of Mueller’s lieutenants marveled at the contrast. Domestic plots are not routinely included in the President’s daily briefing or the interagency threat matrix, an FBI official says, even though “the degree of harm is often greater” than in jihadi terrorist plots. This is a troubling revelation, particularly in an article that concludes the FBI would have prevented 9/11. It suggests that the FBI–and the President–might still miss a similar attack launched by the next Timothy McVeigh. Billions of dollars and an entire shift of focus, and yet we’re still not watching white terrorists as closely as we watch brown ones. And on the subject of terrorism investigation, the Time article explains–but does not emphasize–an important detail about the investigation of Aldawsari. As I noted when he was arrested, he was the perfect candidate for a Lone Wolf warrant. He was a non-resident alien and when we got a lead on him he appeared to be (and in fact turned out to be) acting alone. He’s just the kind of self-radicalized non-US person whom the PATRIOT Act’s Lone Wolf provision is meant to target. But, as Acting head of DOJ’s National Security Division Todd Hinnen revealed to Congress in March, we didn’t use the Lone Wolf provision to investigate Aldawsari. Time provides some details about what we did use. When Mueller convened his executive team on Feb. 17, Aldawsari had been under a microscope for two weeks. Four shifts of agents watched the Saudi engineering student 24 hours a day. Vehicles equipped with StingRay transceivers followed him around greater Dallas, recording his cell-phone calls. Agents had slipped secretly into Aldawsari’s apartment, armed with a warrant from the Foreign Intelligence Surveillance Court. They inventoried his chemicals, cloned his computer drive and copied a journal handwritten in Arabic. In Lubbock, the team that searched Aldawsari’s apartment had been interrupted and did not have time to learn whether he had unpacked his chemicals or whether he had the makings for a high explosive that required no phenol. The hasty retreat also left a gap in electronic surveillance, which nowadays has to include not only phone taps and pinhole cameras but voice-over-Internet, social-network messaging and online-gaming consoles. The Texas plot was unfolding across three e-mail addresses, which sent one another lists of “targets” and “nice targets” and directions for handling TNP. Was it one man? Two? Three? The search team had to get back in. Mueller had no patience for explanations that agents were doing “pattern-of-life analysis” to find an opening. “You’re not getting it done,” Mueller said. “What are you going to do about it?” Later that day, the sneak-and-peek squad got it done. Then the investigators solved the mystery of the three e-mail addresses: Aldawsari was using all of them, they concluded, to send notes to himself. While this passage doesn’t explain all of the warrants (or lack thereof) the FBI used to investigate Aldawsari, it’s clear they were able to get a Sneak and Peek warrant (as well as, presumably, warrants to wiretap his communications) without having to resort to the Lone Wolf provision. That seems to support the argument of those like Julian Sanchez, that investigators have the tools they need to find someone like Aldawsari without continued approval of the Lone Wolf provision. Besides, the Lone Wolf wouldn’t be available to investigate the far more dangerous bomb used in the MLK Day attempt. Maybe we should focus on guarding against terrorist attacks by American citizens rather than trying to extend powers we don’t need to investigate the non-citizens we’re already scrutinizing closely. As MadDog and I were discussing on this thread, the May 6, 2004 Jack Goldsmith opinion on the warrantless wiretap program references an OLC opinion that appears not to have been publicly released or, even in the course of FOIA, disclosed. Last week, U.S. Attorney General Eric Holder admitted what bmaz laid out yesterday — the problems with prosecuting WikiLeaks’ Julian Assange under the Espionage Act. But at the same time, he said, the Espionage Act may play a role in a possible Assange indictment. So even with all the problems in applying the Espionage Act to Assange, Holder is still invoking the provision in his discussion of the “tools that we have at our disposal” to combat Assange. Legally, the stance could have import beyond the question of whether or not they can indict him. A wire or electronic communication service provider shall comply with a request for subscriber information and toll billing records information, or electronic communication transactional records in its custody or possession made by the Director of the Federal Bureau of Investigation under subsection (b) of this section. Or this language from Section 215 of the PATRIOT Act, which allows the FBI, with FISA Court approval, to require private businesses to secretly turn over a broad range of business records or tangible items pertaining to any investigation DOJ asserts is an espionage investigation. Between these two provisions, the government can collect a wide range of information on US persons — things like donations via credit card and server data — simply by claiming the investigation involves spying. They don’t have to even claim there’s a connection between those US persons making those donations or accessing the particular server and the alleged spy. They don’t have to prove that the case involves spying or that they have the ability to indict under the Espionage Act. They only have to claim they are pursuing an authorized — ultimately, the AG does the authorizing — investigation to protect against spying. Which is what the Attorney General is suggesting here, that they are investigating Assange and the Espionage Act might play a role. Mind you, they’d also have to claim (to themselves, in the case of the NSL, to FISC in the case of Section 215) that they were collecting data on a US person for reasons above and beyond that person’s First Amendment right to read stuff on the InterToobz or donate to people the government is loosely alleging may be sort of like a spy. Mind you, if the government did collect — say — the names of Americans donating to WikiLeaks via MasterCard or Visa or Paypal, or the names of Americans accessing the WikiLeaks site for the day Amazon hosted it, those people might have a great lawsuit claiming they had been targeted for First Amendment protected activities. If they ever found out they were targeted. But of course, we don’t have any way of knowing whether the government decided to use the PATRIOT Act provisions allowing them to collect data on Americans so long as they assert a connection to an Espionage investigation. Because that all remains secret. Now, I have no idea whether the government is doing this (though I could imagine that if financial service providers like MasterCard and Visa got a really onerous request from DOJ, they might choose to end their relationship with Assange rather than provide ongoing compliance with the DOJ request). But it seems these PATRIOT provisions are just the tip of the iceberg of potential investigative techniques they could have access to (FISA wiretaps are another) based on the stance that DOJ is investigating Assange for spying, whether or not they ever intend to charge him with spying. Bob Herbert is right, it is “a gruesome, racist practice”. Thank god we have a Constitutional law scholar President, expert in civil rights and dedicated to protecting the liberties afforded by them. This is a perfect situation for the President’s Privacy and Civil Liberties Oversight Board! When President Bush two years ago failed to name members to a federal board to monitor the protection of civil liberties, Democrats and activist groups were duly outraged, seeing it as one more example of his administration’s indifference to the subject. As Fatster noticed, the Ninth Circuit has ruled against Brandon Mayfield on his attempt to hold the PATRIOT Act declared unconstitutional under the Fourth Amendment. Mayfield was a former suspect in the 2004 Madrid train bombings. After the Madrid bombings, the Spanish National Police (“SNP”) recovered fingerprints from a plastic bag containing explosive detonators. The SNP submitted digital photographs of the fingerprints to Interpol Madrid, which subsequently transmitted them to the FBI in Quantico, Virginia. The FBI searched fingerprints in its system and, among other possibilities, produced Mayfield, an US citizen and lawyer from the Portland Oregon area, as an alleged match. FBI surveillance agents began to watch Mayfield and follow him and members of his family when they traveled to and from the mosque, Mayfield’s law office, the children’s schools, and other family activities. The FBI also applied to the Foreign Intelligence Security Court (“FISC”) for authorization to surreptitiously place electronic listening devices in the Mayfield family home; searched the home while nobody was there; obtained private and protected information about the Mayfields from third parties; searched Mayfield’s law offices; and placed wiretaps on his office and home phones. The application for the FISC order was personally approved by John Ashcroft, then the Attorney General of the United States. The Spanish SNP, however, looked at the FBI evidence and found it lacking evidentiary credibility. In spite of this fact, the FBI submitted an affidavit to a US Federal court, stating that experts considered the identification of Mayfield 100% positive, intentionally failing to advise that the SNP had reached a diametrically opposite conclusion. As a result, Mayfield was arrested and held on a material witness warrant, and the public informed of his identity and supposed involvement in the bombings. Over two weeks later, the SNP conclusively matched the fingerprint to an unrelated Algerian citizen and Mayfield was absolved. Mayfield sued the US Government under numerous theories including that the PATRIOT Act was unconstitutional under the Fourth Amendment. The government, being in an egregiously bad position, settled with Mayfield and even allowed the unusual provision that he could maintain the Fourth Amendment challenge to PATRIOT, but could only obtain declaratory relief, not monetary damages. Mayfield pressed his complaint seeking a declaration that PATRIOT was unconstitutional under his stipulated facts, and the District Court of Oregon, in denying the government’s motion to dismiss and granting Mayfield’s motion for summary judgment, agreed with Mayfield and ruled in his favor. The government appealed to the 9th Circuit arguing that the trial court had no jurisdiction because Mayfield had already been compensated, that the court erred in finding PATRIOT unconstitutional and that other matters, in totality, placed the matter outside of the court’s power to award redress. These arguments were proffered by the government in spite of it having knowingly and specifically agreeing that Mayfield intended to raise and argue said issues and agreeing in their unusual settlement agreement to let him do so. I’ve been focusing on how Section 215 of the PATRIOT Act may have been used to investigate Najibullah Zazi, but Dina Temple-Raston had a great story yesterday cataloging the range of techniques (though she doesn’t name Section 215 specifically). I’ve seen a number of vague suggestions for when investigators first focused on Zazi. While she doesn’t describe it as the first thing that made investigators focus on Zazi, Temple-Raston does reveal that Pakistani intelligence gave the US information about Zazi’s actions in Pakistan. Sources say officials acted after Pakistani intelligence allegedly told them that Zazi had met with al-Qaida operatives there. From the context, it appears the US may have gotten this tip shortly after Zazi returned to the US in January. From there, it appears the FBI applied for an got a roving FISA wiretap. Temple-Raston provides a detailed explanation of what a FISA wiretap is, noting that it can be used for emails as well (remember that investigators had identified three email addresses Zazi used). In his case, officials tell NPR they asked a judge for what’s called a roving FISA wire tap. Law enforcement officials close to the Zazi case tell NPR that the FBI applied to a special court for the wiretap months ago. And note, since they already had intelligence from the Pakistanis, it would presumably have been easy to justify a traditional FISA warrant–not to mention establish reasonable cause for any of the other FISA or PATRIOT Act tools in question. After they got contacts from Zazi about developing bombs (perhaps in July or August? ), it appears they started tracking Zazi more closely. The FBI followed Zazi all the way from Denver to NY–and staged a drug stop on the George Washington Bridge. FBI agents followed him on the 27-hour drive. And, just to make sure they tracked Zazi closely, they asked local law enforcement for help along the way. Zazi was pulled over several times for speeding. He apparently got a ticket in Kentucky. And the FBI knew about it. When Zazi neared New York City on Sept. 10, the New York police pulled him over on the George Washington Bridge. Officials familiar with the case tell NPR that was an orchestrated operation between the FBI and NYPD. They wanted to make sure there weren’t any chemicals or a bomb in Zazi’s car. They told Zazi it was a routine search and, just to underscore the point, pulled over other cars on the bridge as well.